This is a guest blog post by Nancy Settle-Murphy, founder of Guided Insights, author of Leading Effective Virtual Teams and renowned expert in virtual collaboration and team communications. Over the years, I’ve developed a number of best practices to increase productivity in virtual meetings. Unfortunately, as I discovered, many of these techniques work better in North America. Two years ago, I was working with an international team — people from France, Japan, and Bolivia — in a virtual meeting format. After I asked what I thought would be a stimulating question of the group, everyone on the call went silent. From my experience, silence indicates unengaged attendees, so I quickly tried some tactics to re-engage them. I asked a question about the idea, started a poll, and added more thoughts into the chat box. I could sense something wrong, but wasn’t sure what. A few uncomfortable seconds passed before someone sent me a private message. Afterwards, I learned that in some cultures prolonged silence is welcomed as essential reflection time in meetings, and that many need time to translate into and out of their native language. My tactics had come across as pushy. After the meeting ended, I made a second mistake. I sent out my notes of the discussion. The next day a different participant emailed me and said, “We all know what we agreed to. We feel like you don't trust us to follow through unless you send us a summary." As I discovered, our national cultures can predispose us to communicating and listening in certain ways that don’t mesh well with other cultures. This is especially the case in virtual meetings, when we often don’t have the benefit of body language or eye contact, so the chances of miscommunications and misunderstandings can be extraordinarily high. I got no further than the first chapter before I started to jot down dozens of ideas. 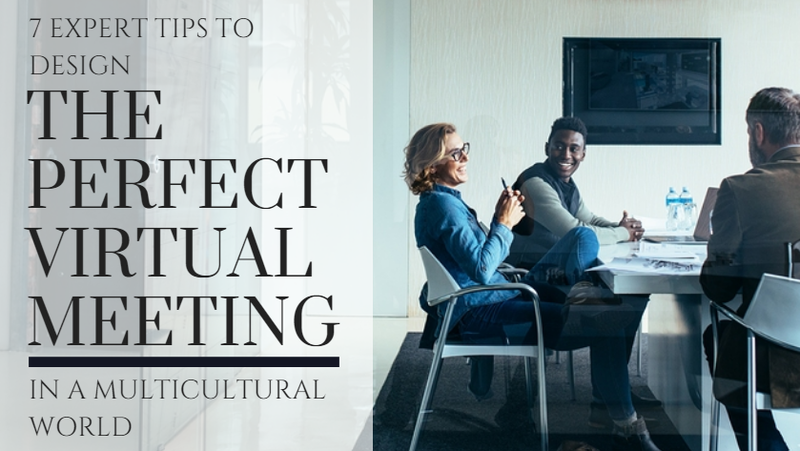 If you’re working with an international team and looking to make your virtual meetings more productive, here are seven helpful thoughts based on Erin’s research. For the sake of this article I am only going to focus on the first scale, Communications. 1) It's not enough to learn about the communication predispositions of other cultures, we need to understand how our respective cultures differ relative to each other. For example, I may know that among Europeans, the French derive a particularly high degree of meaning from the context of a message (a.k.a. "high context"), and may not need or want detailed status reports. Americans, on the other hand, like everything spelled out explicitly (a.k.a. "low context"). The fact that Americans are on the different end of the spectrum than the French suggests that we have to strike a balance that all can live with, even if no one is 100% thrilled. 2) Accept responsibility when communications aren't working. Have you ever felt confused or frustrated when your seemingly clear question is met by dead silence? Just as I experienced, this can feel agonizing in the virtual world. If you pause to acknowledge out loud that perhaps your question was not clear and then go on to ask your question in a different way, chances are a few people will want to chime in. When you sense that you have not been understood, or you don't understand others, a little bit of self-deprecation can go a long way to creating a more comfortable environment in which to sort out differences. In other cases, a long pause is sometimes needed for attendees to reflect on the topic at hand or to mentally translate into their native language. 3) Listen for the real meaning. Some high-context cultures learn at an early age to communicate subtleties and to "listen" between the lines, Meyer explains. This is something the French do quite well and their idiom, sous-entendu means, literally, "under the heard," or saying something without quite saying it. Problems can arise when someone whose culture uses more nuanced communications looks for the hidden meanings in other's words. That search can be in vain when they’re speaking with people whose cultures value explicit communications over hidden meanings. Meanwhile, people who value explicit communications may assume more nuanced communicators are deliberately hiding something. When working with a high-context culture, try asking open-ended questions to gently discover the real answer, especially if you suspect it is an unspoken "no." 4) Consider whether a written recap is needed. Many team leaders believe that sending a summary of agreements makes them more real and helps encourage follow-through. For a low-context culture where things need to be spelled out, succinct meeting notes can be crucial, especially when there are few opportunities to talk things through later on. For a high-context culture, however, the written notes can be less important than the verbal agreements. In fact, I have seen more than one project team member from France, for example, become downright annoyed when U.S. counterparts send detailed notes after every team meeting. 5) Think carefully about the sequence of information. When Meyer first moved to Paris from Chicago, she began her first-ever presentation with her conclusions, a successful approach for her in the U.S. But no sooner had she began when she was interrupted by people insisting that she first reveal her assumptions and underlying logic. She quickly learned that certain cultures use "principles-first" reasoning (a.k.a. deductive reasoning), such as French and Germans, who seek to understand the "why" before they can move on to the "how." Those of us (including Americans) who tend to use "applications-first reasoning" (a.k.a. inductive reasoning) look first for the "how," and sometimes gloss right over the "why." Even though you may have a compelling message to convey, how you structure your message can make all the difference in the world. 6) Multicultural teams need low-context processes. If your team comprises members from a combination of high and low-context cultures, err on the side of using explicit verbal and written communications. When people work remotely, there are few opportunities to discern when people don't share the same understanding of key points. Such misunderstandings can be costly. Encourage your team to create its own ground rules about how members need to communicate to collaborate across time and distance, and check in with each person if you sense any hesitation or disagreement that may go unspoken. 7) A helpful way to approach virtual meetings.